Here’s where you get completely overwhelmed by how much I over organize this. 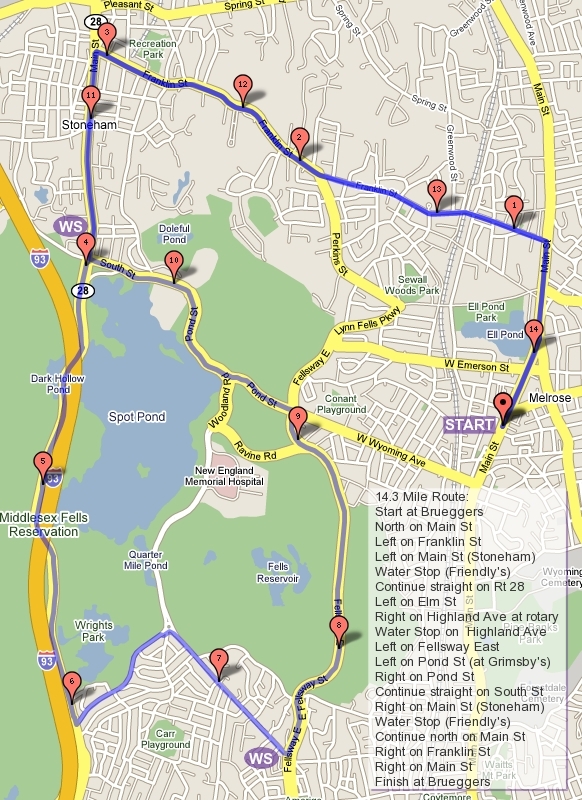 Here is the link to the route for those running it. Memorize it well. If you get lost out here we’re in BIG TROUBLE! For the most part it is straight. Rte 135 to Rte 16 to Rt 30. If you think you’re supposed to turn, you should be at the corner of Washington St and Comm Ave in Newton. And here is thetransportation and water stop plans. Its got a lot of info to make sure we don’t lose anybody tomorrow, and that you’re all well supported all day long. Oh good, I see Haecha is coming too. That’s one more car, one more driver, and a few more seats for runners in case we have any other additions. Speaking of cars and drivers, remember that Hopkinton is 45 miles from Melrose, that BC is 21.5 miles from Hopkinton, and Melrose is at least 15 miles from Boston College. Also remember that gas is closing in over $3.50 per gallon. Feel free to tip your driver. Any questions post them now, otherwise see you before 7AM tomorrow behind Brueggers. This week we leave Breakheart and head to Heartbreak. The plan is to leave Brueggers at 7AM on the dot. Be there slightly early, the cars will pull out at 7. We’ll get to Hopkinton right before 8AM, with a group bathroom stop about a mile before the starting line. A quick picture in front of the Doughboy Statue next to the start, a “does everyone know where you’re going? !” and you’ll be off. Every 3 miles or so there will be water stop cars stretching the way from Hopkinton to Boston College. A car will be designated as the finish line car holding most people’s clothing so you can change at the finish into warm dry clothes. We’ll congregate outside St Ignacius Church, take another group picture, weather permitting, and head back to Melrose. Unless we get more than one more runner showing up, this should work. I was expecting to hear of one or two more but it looks like we’ll fit nicely in 6 cars. Part 2 of the plan, with all the details will be up this afternoon. Hills are your friends. Love the hills, they’ll love you back. You had your first trip to Breakheart last week, this week we take our last trip through. Typically 5 routes bring you through the string of hills through the winter but the snow spared you of that intense hill training this year. As you’re running through them tomorrow don’t complain, don’t whine, don’t swear at me. Instead embrace the hills. They are just one of the many friends helping you get ready for your big race coming up. Love the hills tomorrow, love them while you’re going up them and they’ll love you back as the push you effortlessly back down. Love the hills tomorrow and they’ll love you back on race day when that hill the race directors have put in front of you seem small and short, nothing compared to Breakheart. This week’s run is similar to one we took a few weeks ago in a snow storm. We’ll head up West Foster Street and turn at Melrose Common and find yourself on Swains Pond Ave. Last time this area was decorated in white fluffy snow, this time you’ll see no snow, bright sunshine, and cool crisp air. Swains Pond will loop around to Lebanon St where you’ll go right and then left at the first set of lights onto Forest St. You’ll run past Oak Grove to water stop 1 at the Citizen’s Bank on Main St in Malden. From there you’ll run Winter St past the Oak Grove MBTA stop, through a big intersection straight onto the twists and turns of Glenwood St popping out at the rotary at Highland Ave and the Fellsway where the newspaper boy sits. Turn right there and follow the Fellsway East onto the LynnFells Parkway to the knoll across from the Melrose Middle School where water stop 2 will be waiting for you. Leaving water stop 2 you follow the LynnFells straight out to Breakheart’s Saugus entrance where water stop 3 is. A loop of Breakheart counter clockwise (to the right first through the flatter section of Breakheart leaving the hills for last) and you’ll pop back out at the same water stop again. There you’ll head back along the LynnFells to the knoll where the next water stop will still be waiting for you. Leaving there you’ll follow the LynnFells to Grimsby’s, turn onto West Wyoming, turn left on Main St and BOOM, you’re back at Brueggers. Before I get to the roll call we need to take care of some business for next week, our road trip to Hopkinton. he way that run works is we all meet at Brueggers at 7AM. We carpool to Hopkinton, take a group picture in front of the doughboy statue near the start, then start the run to Boston at 8AM. Water stop crews move the cars, support the water stops, leapfrogging all morning long. Some runners don’t run the whole course, somewhere in Wellesley we pickÂ them up and a new set of short route runners head out on the course. We all end up at BC with all the cars and runners, lounge in the sunshine near the steps of the church at BC, take a big group picture and head back to Melrose. Typically most of us end up at the Dockside and celebrate the start of the Boston Marathon taper for most of the afternoon. Now I need to know who has a car they can contribute to the mix, who can support water stops, and who plans on running what next week. I’ll take that info and through the week we’ll plan out the day with posts and replies on this blog. So…. who’s in tomorrow and for how much, and who’s in for next week and how? ROLL CALL!!! Last week we had great weather for our 20 mile run. A lot of our regular runners were off in Salem running the Black Cat 10 or 20 milers. A few more were in Clinton Running Stu’s. We did fill in the holes with some great company from Somerville. A handful of SSR runners stopped in, helped with the water stops, and enjoyed our challenging 20 mile run to the Mystic Lakes and back. They noted the course, the company, and the water stop selection as things that set our Sunday Long Run apart from others. It was nice to meet them and perhaps we’ll get together more often for runs. This week we’re blessed with what is forecast to be good running conditions. Maybe a few rain drops to start, but mostly clear skies and temperatures in the 40s. To recover from the 20 mile run, we’ll step way back to 16 miles. It’ll start out very flat up Main St and around Lake Quannapowitt. From there you’ll head across Nahant and over to Breakheart. I believe Breakheart is ready for us, I’ll check on it later today. Most of the snow and ice has been washed away everywhere else so I think we’re good to go there, although flooding may be an issue. From Breakheart we’ll head back to Main St and home to Brueggers. Shorter distances can be 6 miles to the water stop and back, about 8 running the route up to the lake and over to North Ave, or 10+ by just skipping the side trip to Breakheart. Another option for 10 is driving to the water stop and looping Lake Q and Breakheart with the group. Lessons learned from last week: I hear at least one of our runners experienced some blisters on the 20 mile run. My tip, given to me by a podiatrist, is to spray antiperspirant on your feet before the run. Blisters come from sweaty feet rubbing against your socks during the run. While most search out the right sock, he suggests getting rid of the sweaty. Barefoot runners get cooled by their feet sweating. Us shoe wearers don’t get any benefit from it. So antiperspirant will rid your feet of the moisture that leads to blisters. I used to suffer from blisters and since I started to do this I’ve been relatively blister-free. Also, I told many of you last week, EAT! You’re exercising for 3 to 4 hours on these runs. Unless they’re sleeping I think its rare for people to go that long without eating when they’re just sitting around working or watching TV. What makes you think you can exercise that long without eating. Don’t wait for 26.2 to realize you need this. We have the food and drink at the water stops for a reason, you DO need it. Try it now, see what works for you. Speaking of water stops, there’s one common stop for the whole run tomorrow. Barry or I (or both) can handle it. If something comes up and neither of us can make it, BrianW has offered to put his car out there for us, so we have all our bases covered. Week 9 – One of the Biggies! This week those in our group training for Boston will be taking on their 20 Miler. A big run indeed. Here’s your opportunity to practice more than just the running. Put your game day plan in action starting the night before. Whatever you plan on eating for dinner the night before Boston, give it a try tonight. When you wake up in the morning eat your planned race day breakfast. When you get dressed put on those socks you think you’ll wear. Those shoes you want. That sports bra that you’re not sure will chafe or not. Temperatures will be in the 40s and 50s for a change so you might want to try out the exact outfit you’d wear if you hit that weather on race day. Speaking of weather, did you hear what I just said (or read what I just typed actually) ITS GONNA BE ABOVE FREEZING! For the first time in what feels like forever we’re gonna have a Sunday Run above freezing. It may be raining however, so dress appropriately. For those a bit intimidated by the distance of this run, take this one as 5 trips to the water stop. From water stop to water stop is far as you have to go at any one time so don’t think of it as one big run but 6 short ones. The route: you’ll love it. Starting out West Wyoming we pass the Stone Zoo past Friendly’s and out Park St. A right on Marble over I93 to the first water stop. One down. From there you’ll head down Forest St to a left on Highland Ave, through the hills to the end of Highland. Water Stop 2 already. Now we’ll break some new ground for this season. Turn left on Rt38/Main St and go about a half mile to Playstead Rd on the right. Turn on to this wide road by Oak Grove Cemetery to cut over to Rt60. At Rt60 you’ll be at theÂ West Medford Commuter Train stop with a Dunkin Donuts in front of you (a popular place to take a break, if you know what I mean). Turn right onto Rt60/High St and follow this towards Arlington. There is one tricky point here, where High St branches. A right would take you to Grove St, no matter how straight that looks DON’T GO RIGHT HERE!Â Stay to the left to follow High St. You’ll end up at a rotary, you’ll see a bridge that heads into Arlington, DON’T GO OVER THE BRIDGE. Take a right onto Mystic Valley Parkway. A very nice road with pleasant views, enjoy this flat fun part of the run. At the end of this road you’ll turn right, go under the commuter rail and turn left to stay on the Mystic Valley Parkway. Here you’ll find water stop 3. Leaving here you’ll skirt the edge of Winchester Center and take a left at the second set of lights onto Washington St. Washington will take you across Mt Vernon St where you’ll then keep to the right to stay on Washington St. Follow Washington St all the way to Forest St (look for the Gingerbread Construction Company as a landmark) and turn right to follow a series of hills back up Forest St to water stop 4 (same as water stop 1). Next you’ll head back to Marble, turn right at Friendly’s onto Rt28/Main St in Stoneham and travel the back side of Spot Pond. Turn left on Elm to continue the loop of Spot Pond, and right on Highland Ave for the final water stop of the day. From Highland you’ll run to the rotary at the Fellsway East, turn right and flow through the hills of the Fellsway East to West Wyoming Ave (Grimsby’s). Turn right onto W Wyoming, left on Main and back to Brueggers! Shorter route? You can either start with the longer route runners and enjoy the route described or meet at water stop run and run the middle of the route for about 10 miles. Water Stops, Barry and I will do our best to cover the stops, one more helper would make the plan run a lot smoother. Who’s in? This is a good question this week. With a 20 miler in Salem and the Stu’s in Clinton we’ve got a lot of runners heading off to do their own thing. We may have some visitors join us from Somerville though to fill in some of the holes. Either way it would be a great help to know before I head out to buy Gatorade and water so if you’re a regular or a visitor, please post here to let us know you’re coming. So again, who’s in? ROLL CALL!